My father Allan was born in Småland in the south of Sweden as a farmers son. He was the oldest boy and was expected to take over the farm but instead he showed interest in art and handicraft. He started his education and practice in this field instead and got his journeyman´s certificate as a wood sculptor when he was 24 years old. After school he was working in many different workshops in Stockholm cutting rococo furniture until early fifties when he became a free artist. 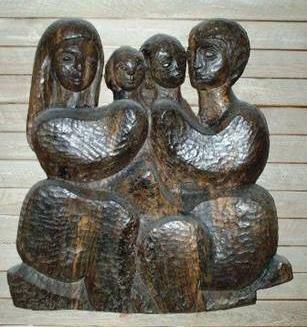 He made his sculptures in different materials but his main materiel was still wood. The favorite was black oak drowned in water for hundreds or thousands of years and therefore turned black. In the summertime he was diving for the oak and the rest of the year preserving and cutting it. After long times of hard work sculpting wood his body said stop. And it is here I come in. We started learning how to make bronze castings. And now he could continue his work in soft materials as clay, wax and plaster and then cast in bronze.In his later years his health worsened and he was more like a supervisor giving me directions. Allan died in 1999. He became 80 years old. Tingsryds vocational school 1937-39, Västervik wood carving school 1940-43, Konstfackskolan Stockholm 1943, Otte Skölds and Edvin Ollers painting school. Among a dozen other exhibitions, Galleri Aestetica Stockholm 1953, 56, Sockenstugan Tingsryd 1954, Smålands Museum Växjö 1957, Adelsö Hembygdsgård 1960, Blå Lyktan Upplands Väsby 1964, Stenmans konstsalong Stockholm 1965, Tingsryd Library 1971,79, Sydosten Kalmar jury criticised exhibition 1989,93. From 1982 participate in all of Tingsrydgruppens exhibitions. Family of black oak from the nineteen seventies. H = 90 cm. 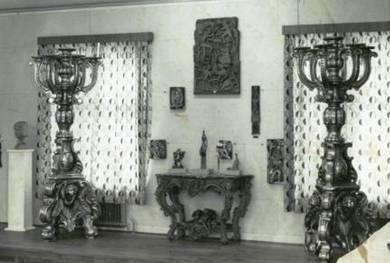 Apprentice's examination work, rococo table 1943 and candelabras for church of Tingsryd 1954.